That’s the short and succinct tagline attached to this blood-red teaser poster for Daredevil season 3, which is shaping up to be much, much darker than previous installments. For one, this ominous one-sheet places Matt Murdock’s famous mask on top of an unmarked grave in New York City. Perhaps it’s Murdock’s own final resting place, given his brooding speech in the recent Daredevil promo (more on that later) that was attached to Iron Fist‘s second season? It’s too soon to tell. One thing’s for sure: the third chapter of Marvel’s premier Netflix drama will pick up soon after the calamitous events of The Defenders miniseries, which left Matt Murdock on the brink of death. It’s a trajectory that will allow the Powers That Be to adapt Frank Miller’s famous “Born Again” comic, which ought to please long-time fans of the Man Without Fear. Pretty cool, no? 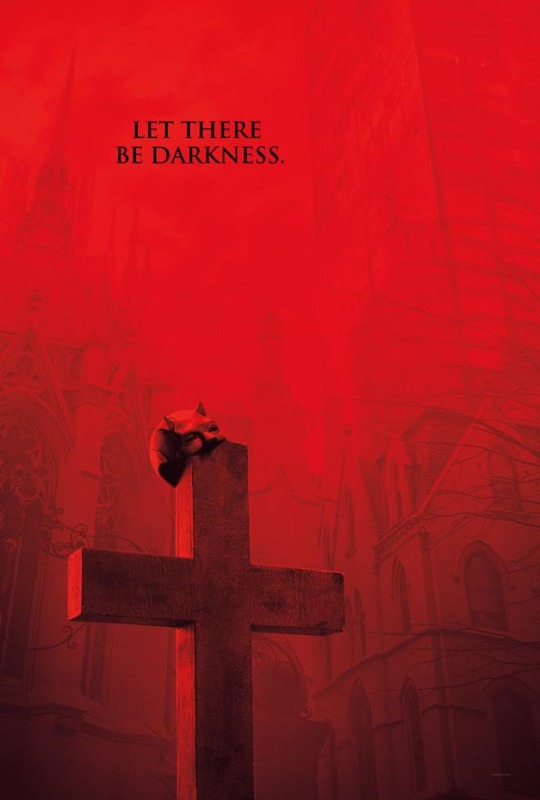 It’s another timely reminder of Daredevil‘s religious roots, given this poster delivers its own devilish twist to the iconic “let there be light” quote from the bible. Matt Murdock is a devout (?) Catholic, of course, so it’ll be interesting to watch that dynamic evolve going into season 3. “I once believed that justice could be found in a court of law, and in the light of day. But I was fooling myself. Darkness only responds to darkness. And the truth is… I’d rather die as the devil, than live as Matt Murdock.” Said to be a return to form for the Devil of Hell’s Kitchen, season 3 of Marvel’s Daredevil is expected to premiere sometime before the year’s end (October 19th, perhaps? ), and when it does, it’ll seemingly include yet another awesome hallway fight scene.